Spa pergolas are becoming very popular. A free standing vinyl pergola is perfect for this use. The vinyl will hold up very well around the moisture of the spa requiring only some minimal cleaning. Dimensions can be drawn out to cover hot tubs of any size or shape. 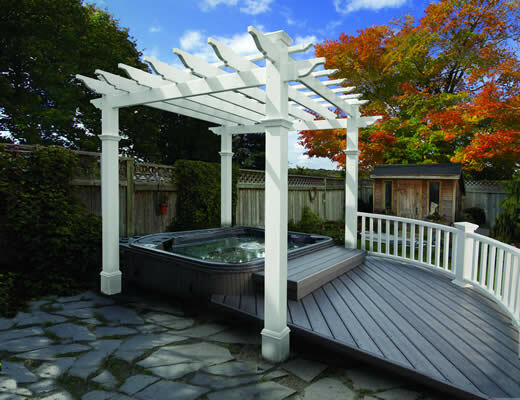 The posts in this spa pergola picture have additional decorative trim pieces to give a more elegant appearance. The pergola gives the appearance of a separate outdoor room and will provide shade for daytime use. Seasonal lights can be draped around the posts or across the roof to enhance the romantic atmosphere at night. There are vinyl pergola kits available, much like this one. You simply just order it and install it. There is no running around for all of the materials you’ll need. It can be conveniently delivered to your home and you can enjoy your new covered spa on the same weekend. 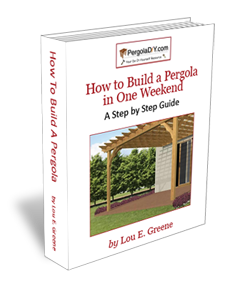 Pergola kits are all inclusive with every piece of hardware you will need to install the pergola where you want it. When you order it, you simply indicate whether you will secure the posts in ground, on a deck or on a concrete slab and it will be shipped with the exact items and instructions needed. All you will need are a few small tools and another pair of hands to help, but the instructions are so detailed that you really wont need any particular skills at all. Everything will be pre-notched and drilled and marked to make snapping the roof, base and trim pieces on extremely easy.